South Jersey Facebook – Native Or Display Advertising? Equity Digital Advertising knows a little bit about South Jersey Facebook and Instagram Marketing campaigns. Looking back over the past 3 years we’ve run a little under a billion impressions, resulting hundreds of thousands of conversions for our partners and clients. Facebook’s new collection ad, an ad unit seemingly underutilized locally in south jersey and only utilized by national brands in my News Feed have been the most effective of late. However, the key to successful campaigns is not only the type of ad unit you’re placing catching your customers attention, but where you’re placing that ad. That’s where Facebook Premium buying comes into play. “Messenger” is Facebook’s mobile instant messaging app that you can download separately from Facebook to communicate with friends and family. This is an important ad placement to buy because 64% of Facebook users use Messenger, and since its debut became the most popular messaging app in the world. We incorporate traditional News Feed ad buying with Messenger utilizing the same creative and same targeting that is running for your Facebook News Feed campaign. It’s important to note ads in Messenger are mobile display only (no video) and can be single image or multiple images. Facebook Instant Articles give you content with the click of a button. When you see interesting news articles in your News Feed, simply click and the article loads within the Facebook app – no waiting for the publisher’s website to load. Then, your Facebook ad appears within the article from that particular publisher, while staying on Facebook. Similar to Messenger ads, the same creative utilized in a traditional News Feed ad can be used with Instant Articles. Facebook Instant Article ads are mobile display or video and can be single image or carousel. We at Equity Digital lovingly call this network “FAN” for Facebook Audience Network. 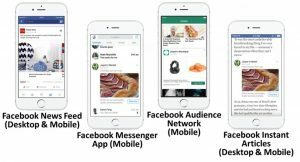 FAN is a mobile only ad network that Facebook put together partnering with other websites and apps, now the largest mobile native ad network in the world. Using FAN allows advertisers to extend their reach, targeting people both on Facebook and when they are off of Facebook, using the same targeting categories. This is an important ad placement because Facebook reports a “12% increase in website conversions with Facebook and Audience Network combined”.